Due to the steady expansion of sewing machine output and to create additional capacity for bicycle production, Bernhard Stoewer Sen. founded a new enterprise in 1893. For it he chose a site in Neutorney, a district of Stettin only a few kilometres from the headquarters. At Neutorney there was plenty of building space, an important requirement for an expanding factory. Here parts of bicycles, machine tools and iron ovens for both domestic and industrial use were produced. At this new factory the founder’s two sons, Bernhard Stoewer Jun. and Emil Stoewer, were employed in managerial positions. However, this did not satisfy their youthful, visionary thirst for action. Something, something different, had to happen. The automobile was a fitting challenge. The Stoewer brothers recognised that a great future lay ahead for the automobile, even though at that time it was regarded as a plaything for a few rich people. 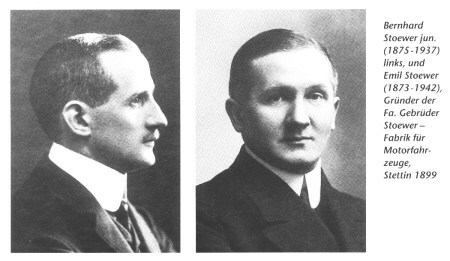 Bernhard Stoewer Sen. trusted his sons’ idea and in 1899 handed over the Stettin Ironworks to them, so that they could realise their dream of making automobiles. From then on the Ironworks were known as “Stoewer Brothers, Automobile Makers”. Bernhard Jun. became the head of the technical side while Emil was responsible for the commercial part. Until their departure from the company in the 1930s they made all the decisions concerning the development of their company and, through their trendsetting policies regarding new models, were the driving force behind its rapid growth in the early years. 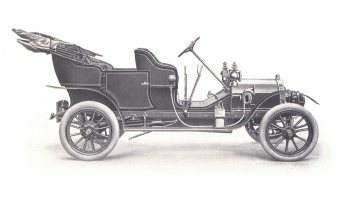 They were also responsible for the later stagnation as other German automobile manufacturers, in the same circumstances and with the same modest beginnings, outstripped Stoewer Bros. Nevertheless, one has to acknowledge that Stoewer was one of the few automobile factories, out of 200 in Germany, that survived the worldwide crisis of the early 1930s. The special thing about Stoewer is that it never was a big producer but remained a manageable size. It shone more through technical innovation than sheer numbers and this is what makes it interesting to the Classic Car enthusiast today. Total Production was about 40,000 vehicles from 1899 – 1945. About 250 vehicles are known to exist today. 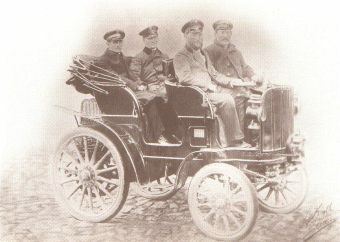 The Stoewer developed “Großer Motorwagen” (Big Motor Vehicle) of 1899 was the starting point of all Stoewer automobiles. It can still be admired in its original condition in the Polytechnic Museum in Moscow. The Stoewer G 4 was the first bestseller from Stoewer. A total of 1,070 of these 4 cylinder, 1.5 lit c.c. engine cars were built from 1908 to1910 in many body varieties. Here you can see the Double Phaeton. The D-type determined Stoewer’s programme from the beginning to the mid-1920s and had a reputation as a robust, sporty car. There were Types D3, D9 and D10, all with 4 cylinders, and the D5, D6 and D12 with 6 cylinders. An exceptional model was the 1921 D7 with a 6 cylinder Stoewer aero engine with 11 lit c.c. and 120 bhp – Germany’s most powerful car at that time. Right: The Stoewer D9 as a 6 seater. In 1928 Stoewer brought their types S8 and the bigger G14 onto the market. 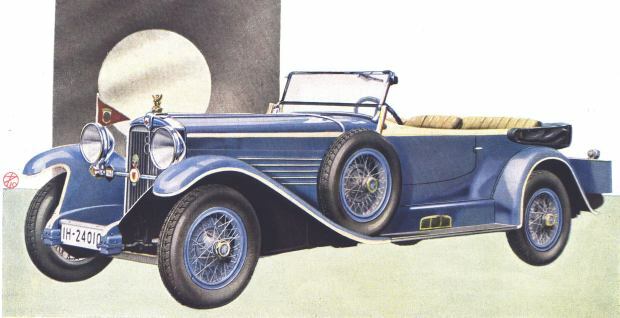 Along with the Horch models, they were the first 8 cylinder German cars. While the G14 with a 3.6 lit c.c. engine had sufficient power, it soon became obvious that the 45 bhp 2 lit engine of the S8 was somewhat underpowered for its weight of over 1,200 kg. Thus, in the same year, its successor, the S10 with a 2.5 lit engine was put on the market. So too was the G15, a more powerful version of the G14. With the G15 “Gigant” (Giant), the M12 “Marschall” (Marshal) and the P20 “Repräsentant” (Dignitary) models, Stoewer reached its highpoint. The Marschall had a 3 lit engine with 60 bhp and the Gigant a 4 lit one with 80 bhp. The top model was the Repräsentant with a 5 lit engine giving 100 bhp. It weighed 1,400 kg and reached 130 km/h (80mph) – for those times a really remarkable performance. The end of the 1920s and the beginning of the 1930s were lean years for business as the luxury car market shrank. 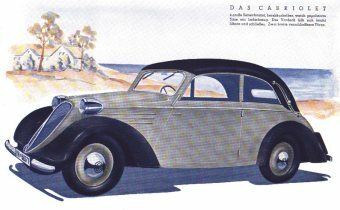 Nevertheless, between 1928 and 1934, Stoewer produced 2,300 8 cylinder cars of various models. The Gigant and Repräsentant were built until 1933, and the Marschall until 1934 when the era of big, luxury Stoewer cars with in-line 8 cylinder engines came to an end. It was recognised that the market for this type of car was just too small and so the Stoewer Brothers concentrated on building smaller and more reasonably priced cars. The V5 deserves a special place of honour in the history of cars because it was the first series of German front wheel drive cars to be produced. It started production in 1931, and had a 4 cylinder V-engine of 1.2 lit c.c. and 25 bhp and a top speed of 80 km/h (50 mph). 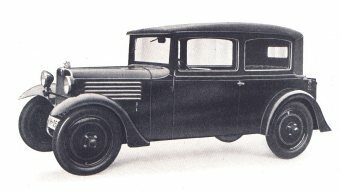 In 1931 and 1932 at least 2,100 units were produced, then the R140 took over. It also had front-wheel drive but the engine was a 4 cylinder in-line one. The V8 “Greif” (Griffin)(the griffin is part of Stettin’s coat of arms) was the last model to be developed under the leadership of Bernhard Stoewer, one of the firm’s founders. From a technical point of view this car, which started production in 1934, is very interesting because it had front-wheel drive and an alloy V8-engine of 2.5 lit. Of all the models that Stoewer produced for civilian use, the smaller “Greif” sold in the greatest numbers – 4,000 from 1935 to 1939. It was powered by an air-cooled 4 cylinder boxer engine of 1.5 lit giving 36 bhp. The Greif was not a Stoewer design but was based on the Röhr Junior, which itself was a slightly changed, licensed design of the Tatra 75. After the bankruptcy of the Neue Röhr-Werke AG, Ober-Ramstadt, in 1935 Stoewer bought the production machinery together with the Tatra licence and continued output. Bernhard improved the engineering and gave the car a streamlined body. The biggest seller of all Stoewer cars was the LEPKW (Leicher Einheits-PKW, i.e. light standard car). The main customers were the German Armed Forces. About 11,000 were built from 1936 to 1944, at first equipped with a 1.8 lit 4 cylinder engine and then, in 1938, a 2 lit 4 cylinder one. 4-wheel drive and all-wheel steering made it capable of operating in difficult terrain. It is a tribute to their engineering skills that, even with the exacting demand of about 1,800 kg (1.8 tonnes) weight, a top speed of 80 km/h (50 mph) could be reached. From 1940 a simplified version had only 2-wheel steering. 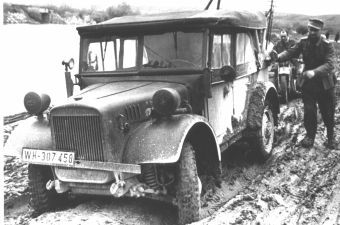 BMW and Hanomag also built a LEPKW – with identical bodywork but different engines. The last Stoewer civilian cars to be produced were the Sedina and the Arkona. They looked the same but under the bonnet of a Sedina was a 6 cylinder with 60 bhp and in the Arkona a 3.6 lit 6 cylinder with 80 bhp. These up-to-date (for those times) models were built from1937 but the approach of World War II and the state imposed change to the production of war materials prevented a successful sales drive. Even so, 980 Sedinas and 210 Arkonas were completed. As with most Stoewer cars, the Sedinas and the Arkonas were made with several body alternatives. Above right: A Sedina limousine.